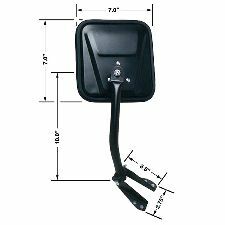 We also have Mirror parts for other Jeep models, including CJ5, CJ7, Cherokee, Commander, Compass, Grand Cherokee, Liberty, Patriot, Wrangler. Thousands of applications available. 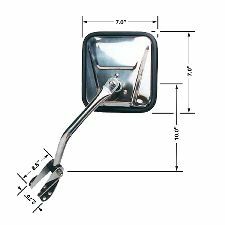 CIPA's OE replacement mirrors offer significant savings over factory cost, and look and fit exactly like factory mirrors. 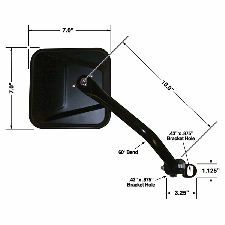 CIPAs Original Style Replacement Mirrors are a cost effective alternative to factory replacements of the rearview side mirrors on your vehicle. They are designed from factory tolerances to fit your vehicle like a factory piece. CIPAs Original Style Replacements Mirrors will bolt right on, with no need to modify the existing bolt-hole pattern. They have the same appearance, and meet the same quality standards needed to restore your vehicle back to its original look at a fraction of the cost. As with all CIPA mirrors, they are QS9000 & ISO 9002 certified to meet the strictest standards. They are rust and corrosion resistant, and feature OE grade glass. In order to meet the OE standard for glass, these mirrors use first surface plating, which means the reflective chrome layer is plated on the front of the glass. The advantage is less distortion from having to look through the thickness of the glass, but a greater risk from surface scratches. 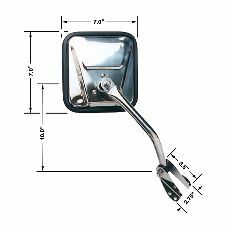 This mirror can also be used as a hand mirror for viewing hard to reach places with ease. 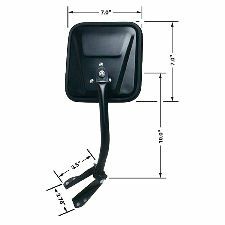 Mirror specifications: Universal position (left hand or right hand), manual, black, telescopic (extendable up to approximately 18 inches), 5" round mirror head, non-heated, with flat glass.